There is a lot of pessimism, although presented with a sufficient dose of humour, in the analysis of the Europe 2020 strategy for EU's growth in this decade in the statement of Pawel Tokarski, a Pole with the Polish Institute for International Relations. He spoke during a conference on EU's Multiannual Financial Framework (MFF) 2014-2020 in Sofia on November 30, organised by the Polish Embassy in Bulgaria and the Centre for Economic Development, a Bulgarian think-tank. The debate was also hosted by the European Commission Representation in Sofia. euinside was a moderator of one of the panels. Pessimism because, actually, the entire debate about Europe's common budget is a hostage of the search for a durable and comprehensive solution of the eurozone crisis. Not all the speakers sounded that pessimistic, though. You might want to see the previous speakers: the introduction and welcoming words, the essence of the debate on the 2014-2020 budget as presented by the Polish Ministry of Foreign Affairs, the always interesting and opt-out British position, and the proposal for own resources, presented together with the Bulgarian position. Adelina Marini: First let me tell you that regarding the idea of an air plane tax I immediately see some direct and indirect losses for many people, because probably the delays of the air planes will become even more serious and thus we will lose the opportunity to communicate with people like you*. And with regard to the corporate tax at a European level, if I was an Irish I would be looking at you pretty oddly. I suggest, because we are very late with our schedule, that we go directly to the second panel, which is "Europe 2020 and the European Budget: How to Return on the Path of Growth". I will transfer moderation to the Centre for Economic Development (CED) who are also hosting today's event. Then, if we have time and if you are not exhausted or hungry, we can go back to the participants in this panel. On my behalf, Adelina Marini and euinside's I would like to thank you for enduring us. Maria Prohaska (CED): Thank you, Adelina. It is a great pleasure to take over on the topic about the budgetary framework for the next programming and budgetary period and its relation to the Europe 2020 programme - a topic, which is of special significance, interesting and for a long time present with what was achieved by its predecessor, the Lisbon Agenda, in the research and publications of the Centre for Economic Development. Therefore, allow me to open the discussion on this topic, which more generally outlines the context in which the budget for the period 2014-2020 is planned and discussed, and to invite our colleague Pawel Tokarski with the Polish Institute for International Relations to present his views, especially about the things related to the hottest problems of the economic and financial crisis, and the necessity of adopting the new budget. Please, welcome. Pawel Tokarski: Good morning everyone. It's really nice to be here. I would admit that this is my first time in Bulgaria and all of us, the Polish guests, had a very difficult night because we slept only about 3 hours. We were really happy to come here to meet you and to discuss with you. So, sorry if we are not fresh enough, but we'll try to do our best. I would say that I have quite difficult subject to talk about. I would try to be brief, first of all, because in the current context the strategy EU 2020 is looking like landing on Mars, especially when we have problems in the eurozone as we have and actually we have no idea what is going to happen tomorrow. Some columnists at The Financial Times are saying that we have 10 days for saving the eurozone, probably 9th of December we will see another comprehensive plan, it is going to be implemented or not is going to be the same like the previous plans which were adopted. We don't know. We don't know what are the solutions. The situation is really dramatic but nevertheless there are some people who can find a bit of sense of humour in this. We can always count on the illustrators of The Financial Times. I think that this picture presents perfectly what is the problem in the eurozone currently. But why am I going to talk about strategy EU 2020 now? Because I think that ... I truly believe that when the European leaders will find themselves facing the wall, they will find a solution finally because a breakup of the eurozone is not in the interest of anyone. Not in the interest of Germany, France or even countries staying outside. So, we should talk, of course, about the possible solution - either it is going to be the ECB, or the EFSF or the stability bonds, which were presented by the European Commission. But we also have to think about medium and long-term goals. As we can see the general government gross debt is increasing in most of the EU countries. Bulgaria is a country with one of the lowest, actually. The real GDP growth is also, the tendency is decreasing and also recent OECD projections which were published yesterday [29 November] were even much more pessimistic. Main problem is how we can generate growth. I think that this cover I really like, because every time I think about economic growth this always comes to my mind. I must admit I'm not a blind enthusiast of EU strategies because I don't think strategies can generate growth by itself. I'm not also employed by the European Commission, so I'm not going to present the official statement but I think that in the EU we have certain institutions, we have certain programmes, instruments and we always can find something useful from that we have to use it. Because we are not here to some kind of policy-political fiction, we should use the instruments that we have, even if they are not ideal we should use the parts which can actually be useful to find a solution in the medium and long-term. To be honest I do not think that countries like Italy and Greece can restructure in 2 or 3 months. Actually I am quite pessimistic about some kind of technical governments, which can bring miracles, so we have to be prepared for a long-term hard work. And I think that some elements of the strategy EU 2020 maybe actually useful. But first of all we should look back to the past and think what kind of conclusions can we draw from Lisbon [Lisbon Strategy]. There was not really a discussion about why it was a failure, what happened. Among the main reasons we should enumerate weak governance, because actually name and shame doesn't work, because of the political reasons. Maybe goals were OK but not realistic because of the economic and financial crisis in 2008. Of course, maybe we should need more engagement from the main member states and we should also point that some countries were really successful in implementing the Lisbon objectives. In the Polish Institute of International Affairs we were doing some kind of intellectual exercise every year, assessing the progress of the EU countries in implementing the Lisbon objectives and now with my colleague Patrick we'll be doing the same about the EU 2020. Of course it's not possible to check how the influence of the strategy was real because there is no real correlation between the strategy and the effects but of course we can see the benchmarks and how the countries were performing. We can admit that some countries, like the Nordic countries, were really successful vis a vis the level of investment in research and development - it exceeded 3%. Or the UK, not only because they have very good universities but because actually they have excellent results in life-long learning (LLL). Strategy benchmarks can be some kind of effective tool for the member states' performance. These assessments were also prepared by other institutions, for example the World Economic Forum, which enumerates Sweden, Finland and Denmark as the best performers of Lisbon strategy and the worst performers, unfortunately we - Poland and Bulgaria - are in the same basket. On the other hand the World Economic Forum enumerated three laggards - Portugal, Greece and Italy. What is the condition of these countries now we can see. So now we have the strategy EU 2020, which was announced in not a very favourable context because it was endorsed in June in 2010 when there were already problems with Greece negotiations over the first rescue package, etc. There are some governments and constant changes. There is progress because there is a centralisation of goals, there is not like a single country plan. A smaller number of guidelines and EU 2020 is also a key element of EU economic governance, so called European semester. The priorities, which are very well known - smart growth, sustainable growth and inclusive growth - headline targets, of course, I think that most of the people in this room are familiar with. And this is important - the three pillars that the Commission enumerates as actually levers for the EU 2020 strategy, so they are single market, trade and EU budget. Today we are talking about the EU budget in particular but not to forget that there are also other levers. 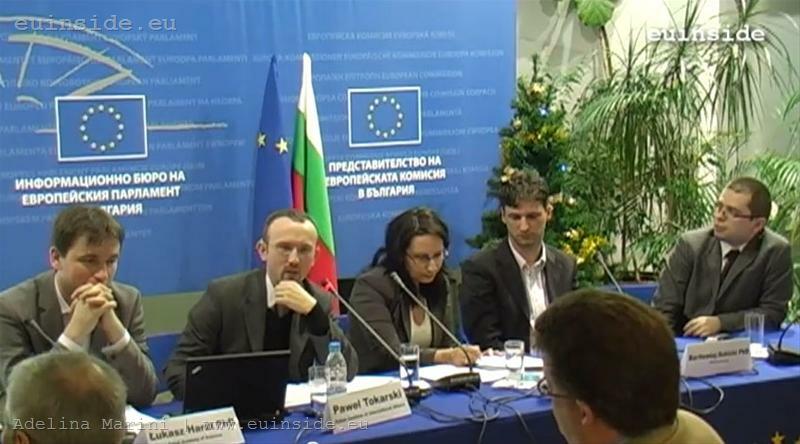 In March this year I was organising a seminar with the British Embassy on how the single market can generate growth in the EU and I think that actually the single market and trade can also be very good instruments but we cannot forget about the EU budget, which of course has its advantages and disadvantages. There's only 1% of the EU GNI but it's a useful macroeconomic investment of the governments for the EU. We also have to take into account that important areas of the EU 2020 are dependent on the member states, like education, research and development. There is also an important role of the private sector. And also the question should be put where the EU money should be spent - research and development, convergence or restructuring. Some people think that these three goals should be the most important. Here we can see how this European semester looks in practise and the EU 2020 but I will not go into details because we are lacking of time. The conditions of the effective governance of the EU 2020 strategy - I think that a strong European Commission is necessary. I think that we understood it perfectly also from the origins from the crisis that the Economic and Monetary Union cannot be based on intergovernmental cooperation. It's not possible! We need strong supranational European Commission is the best institution for that but we also need a political engagement. And this is the European Council level. The question is how the recent reforms, like the Six Pack, and the place for this in this improvement of the governance process for the EU 2020 will be. And we have to admit also that EU 2020 is still based on soft instrument - the Commission has no hard power to force the EU member states to perform better. The question is also how the EU member states can do that. How they can achieve better results in the EU 2020 strategy if we have this tendency to cut the national spending. So, this is also not a very favourable context for the strategy. One can also say that the EU 2020 strategy is a bit too broad because every EU member state sees something different in it, like for example about the single market or the trade policy. Poland about the EU budget, maybe, also about the EU budget. France will be about, maybe, social Europe. So there are some differences in the treatment. Is the EU 2020 the first victim of the crisis? We must admit that it stays in the shadows the miserable effect of the Lisbon strategy, the time of endorsement of the strategy was not very fortunate and when we look at the Stability and Convergence Programmes or the National Reforms Programmes when they are submitted by the member states, we have to say that the quality is not really impressive, and of course there is little coverage by the media. I remember that when the Lisbon strategy was starting there were conferences after conferences about the Lisbon strategy, a lot of articles but after 2005 and then after 2008 everything vanished. So, now people are predicting the overall results of the strategy in the end but I think that we should really take what's possibly the best of the strategy and try to implement it, especially in the current context. So, let me admit that the strategy will have a moderate success. What it's actually needed - I think the most imminent engagement is on the national level. The countries need to really think that their objectives, set by the strategy, are necessary for everyone. It maybe better to use good practises - if we have countries that are performing very good in the sense of e-governance, education or administrative effectiveness, we should take their experiences as an example. We don't have to build a bridge which is already open. We Nordic countries - Austria and the Netherlands - which are performing very well, or Sweden, which has currently quite high economic growth. Maybe more pressure on countries that are not performing quite well - maybe announcing publicly the three best and the three worst performers which would create some kind of media or public pressure on these countries. I think that Cohesion Policy could also be a good tool for creating more uniformity, which is actually needed in the current crisis context. But we should also look behind Europe and also reconsider external trading balances. But all in all everything depends on the evolution of the crisis in the eurozone. If we are facing really troubles I think that the EU 2020 would finish much sooner than it was predicted for it. I truly believe that the crisis in the European integration is also an occasion to put some kind of step forward and to introduce changes that are normally very difficult. So, I would finish here. Thank you very much. Maria Prohaska: Thank you, Pawel. Thank you for your critical view toward the results from the Lisbon Agenda, which should not be forgotten and also about the realistic approach to the Europe 2020 strategy, because often there are cases when there is staggering into the two extremes - either full denial or exquisite praise of Europe 2020. And as it is quite often in life - truth is somewhere in the middle. In fact, the economic and financial crisis only underscores the apparent need of measures to achieve sustainable and inclusive growth. Whether this would be the 2020 strategy or another document, there is no way that we can escape this, so I hope that the member states will find that impulse in their common policy and their national policies to go back on track on the path of growth, including through the tools of the common European budget. *Some of the main Polish guests at the conference were late for their panel because of delays with their flight.